Love the Military Pipe Band; they rock. Wish my school had a military pipe band. It is great to see boys at military schools in skirts; kilts are so terrific. Michelle Rhee is introduced as “Bold, dogged, even intemperate efforts to improve schools in DC.” Results are her relentless focus. Barstow tells of her being praised by both McCain and Obama; indeed there was even that crazy moment during one of the debates when the two senators argued over which of their plans Rhee preferred, as if she were the solomonic judge that could determine the best educational solution. Rhee speaks about the ineffective people in her central office, and how she starting firing them, left and right. Until her general counsel stormed in and told her that firing staff is impossible inside the DC district. When she asks what she is supposed to do with incompetent district personnel, and she is told that she should do what is usually done: send them back into the schools! Rhee speaks of how it is possible that we allow employees to keep their jobs, by contract or union or tenure, who are utterly incompetent, and how is it possible we can tell parents that their children will be in a classroom with an incompetent teacher, someone who will not be able to teach their children how to read. Warren Buffett’s advice on how to fix American schools: this is great. Abolish every private school in the country, and ensure that every child is randomly assigned which public school they attended. The result would be mobilized parents of influence whipping schools into reform and resolution. Onto the challenge of defining what is a good teacher. Rhee complains that there is no agreement on what is effective teaching in her district, (and I would say that many of our independent schools have the same struggle). She confronts one principal, who says all his teaches are effective, and one teacher is discussed; she never seems to do anything. No, no, he replies, she can teach a pretty good lesson when she feels like it. So then Rhee asks, which teacher at this school would you want to have as your grandchild’s teacher? Well, he said, if that is the standard, then none of my teachers are effective. That is the standard, Rhee responds emphatically. Rhee compares two classrooms, in the same building; one where all kids are focused, engaged, attentive, inquisitive, humorous, volunteering; one where the teacher is screaming at the kids to be quiet and turning on and off the lights to demand their attention. We can see the difference of effective and ineffective teaching, and we must do something about it. The kids know, she says, the kids know, ask the kids, they know who the effective teachers are. A big running theme of this blog is to honor the kids, to be real and really listen to what they say, and take it seriously, so I enjoy the point greatly. She tells a lovely story of students coming to see her, and says in passing that she has a policy to always honor a request of students and teachers who wish to meet with her. MR: I believe public education is supposed to be the great equalizer in America. If you work hard and do the right things you can have the American dream. But it is not the reality in America, and is not the same in Washington DC. Still in this day and age we are allowing a child’s zip code and color of skin to dictate their future. But we have a new moment in the US, a new opportunity, an incredibly critical time. But if nothing changes, disillusionment will be profound. Rhee’s message to us at NAIS schools: Make room for scholarship kids. Private and Independent school kids have to exist because you set the bar for educational excellence. Rhee says she knows that it is possible to have a school where every child learns, and every child can go to college, because she saw it be true at Maumee Valley Country Day. Nice standing ovation for Rhee! Rhee pays an enormous tribute to Mayor Fenty, and says despite the enormity of the political fallout from constituents in DC interest groups, he ALWAYS supports her, always supports what is best for kids and learning. 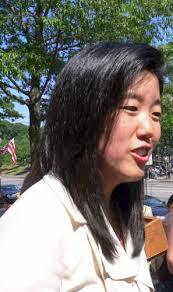 Rhee also praises independent schools for providing on their campuses summer outreach program to public school kids. Huge imploring from Rhee: Too often we sacrifice what is the best interest of kids in the classroom in order to preserve the harmony of relations among adults, protecting adults’ interests at the expense of the interests of kids. We have to stop this! Rhee tells a funny and very representative story about the problems of the food system in the DC schools, and says that the food has been so bad, that she put a clause in the contract that the executives of the food service company must eat the same lunches they serve the kids. She is a rock star; I am besotted. She is such an inspiration and an inspiring leader, and she makes me feel small for the work I do, but I want to honor her call. I know that indeed I can respond to what she calls for: I can provide more scholarships for urban public school students; I can offer more summer programs and after-school programs for public school students, and I can work with all school community members to continue to raise the bar of educational excellence and set an example. I try to repeat like a mantra something the Atlantic magazine said about Rhee: she practices a relentless pursuit of excellence in teaching and learning in every classroom every day, as a signature of her educational leadership. I can live without the bagpipes but Rhee was good. Havine worked in public school system (NYC) for 9 years, I have mixed feelings about Michelle Rhee (although mostly positive). I agree with her disgust of protecting incompetence by contract, union or tenure. I agree with her focus on teacher quality. I am less comfortable with her judgement of competence based on how folks stick to bureaucratic steps (i.e., the woman that cost her half a million might be more an indictment of a ridiculous bureaucratic structure that would lead to that result by missing one meeting or one piece of paperwork). Second, I would like to hear more appreciation for a continuum of professional growth. She seemed too absolutist about not waiting for teachers to improve. I think your points are well taken, and I think there are plenty of other concerns that could be expressed about Rhee’s leadership. I have great hesitations myself about her emphasis on measuring, and rewarding, performance based on standardized, high stakes, test scores. But her passion, and relentless drive, to put learning above all else, and to ensure, at any cost, that every child has a quality teacher, I find very admirable, and the way she describes quality teaching resonates with me. Many of us often speak about putting the interests of children and learning first, but I have never seen a school-leader seem to be so intensely in pursuit of this mission. I am willing to forgive or overlook or minimize some of the negatives that come with it. Did it ever occur to you that Rhee was making up those stories? She has told many stories here in DC about the miracles she’s performing – we don’t see them. We see a demoralized workforce constantly told how bad they are and that it’s all their fault that children aren’t learning. Do you think teachers are completely responsible for student learning? She does. She claims she brought her students in Baltimore in the 90’s from the bottom to the top in to years, but has no proof of it. * Do you believe that? She’s building a whole system on a false memory at best and a lie at worst. She’s also an excellent public speaker — I was “besotted” at first too. Please read the two recent Washington Post article about the teacher Reduction in Force that Rhee called in the middle of the school year, claiming budget deficits (which the city council denies), after hiring 900 new teachers in the Spring – and then tell me if you’re still besotted by her. The first article is a report. Read some of the comments. The second piece is an editorial supporting her actions. See if you think the punitive way she referred to the RIFd teachers is worthy of your praise. Looking for a teaching job? There are going to be a lot of vacancies in DC next year – of good teachers disgusted by how they and their colleagues are being treated, and who are determined to get out of this hellhole.